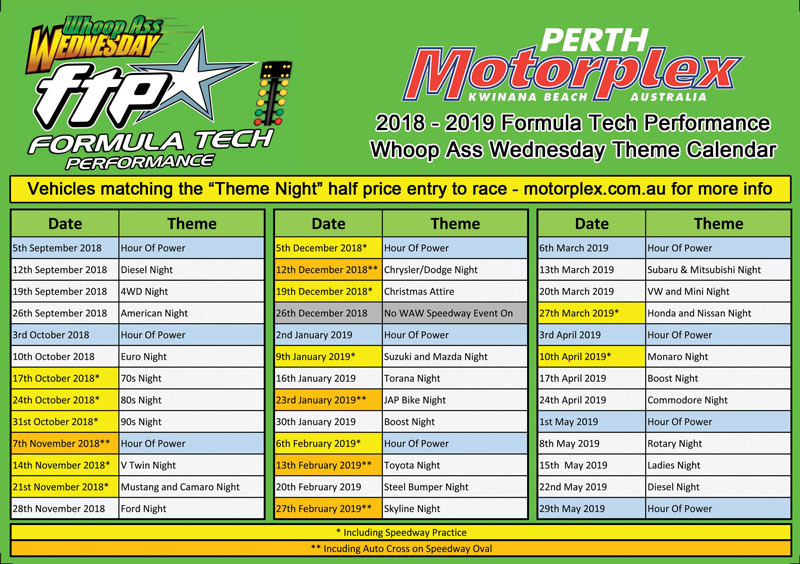 Formula Tech Performance WAW is in full swing and this week we are featuring V Twin Night. Off street drag racing from 6:00pm until 9:30pm and then we will close out the night with Burnouts! Reserve your burnout spot by calling Perth Motorplex on 9419 6622 during office hours. PLEASE NOTE: Spectators Park in GATE 3 Car Park and then ENTER through Competitor Entrance. Our Theme night tonight is V Twin Night presented by Bagger Tricks Custom Cycles! Bagger Tricks Custom Cycles started in 2015, to provide a high quality servicing & custom shop for all Harley Davidson owners. COME TO THE HOME OF AUSTRALIAS FIRST 30″ WHEEL BAGGER! Bagger Tricks Custom Cycles cater for all your Harley needs including log book servicing, tyres, repairs and insurance work. They also supply & fit aftermarket parts from the worlds leading manufacturer’s. In-house finance packages available for all your custom parts and bike builds. Any V Twin powered motorcycle races for half price so get down to Perth Motorplex for some fun on the Drag Strip. Of course all other cars and bikes are eligible to enter at the normal Price of $60.